The lure of drugs and alcohol is capturing today's youth in its fatal grip and may ultimately destroy our nation's future generations. The vicious cycle of abuse is one that parents, teachers, counselors, and other citizens decry on a daily basis. The book provides crucial information on all the major drugs of abuse - including depressants, narcotics, stimulants, cannabinoids, inhalants, steroids, and hallucinogens - and their lethal consequences. The book states that in order to confront the monster that is destroying our children's health and quality of life, we must first understand the psyche of drug and alcohol abusers and the natural progression of the disease of addiction. The book reveals the harmful combinations currently in vogue in the drug world and the short and long-term effects they have on the body, and discusses ways to recognize and pinpoint the telltale signs of a user. It explores the question of why adolescents abuse drugs, as well as special issues affecting young female addicts. This book also examines the fatal relationship between drugs and AIDS, and includes a brief history of AIDS, and lifesaving advice on AIDS prevention. The book assesses the various inpatient and outpatient treatment choices. It realistically portrays the intense physical and emotional stages the user will pass through before becoming drug free, as well as the stresses placed upon families during the recovery process. As this valuable book relates, parents, teachers and counselors have clearly defined roles, and each can use his or her own brand of influence to aid the adolescent on the journey back to a healthy mind and body. Finally, The book presents a list of successful options available if a first treatment attempt should fail. We live in a society where 12-year-olds are budding alcoholics and children are bombarded in school hallways with solicitations to experiment with illicit drugs. With the practical wisdom of this authoritative and accessible guide, we can learn the techniques that will save our next generation from ruining their lives through hopeless addiction. Publisher's Weekly: "Prevention of alcohol and other drug abuse by adolescents has been a less than successful outcome of the national "war on drugs,'' as attested to by figures cited in this comprehensive reference. Milhorn, who directs chemical dependency services at Laurel Wood Center in Meridian, Miss., examines the question of why adolescents abuse drugs and urges parents and teachers to become educated in this matter. Collected here are expositions of the psychological and physiological aspects of drug use, the pharmacology of major items of abuse and a survey of treatment choices. 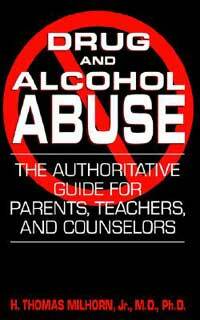 Replete with appendices, including video sources, this is a valuable resource designed to strengthen the disparate yet cooperative roles of teachers and parents in their efforts to prevent adolescent addiction." Max A. Scneider, M.D., C.A.S., Former president, American Society of Addiction Medicine; Secretary, National Council on Alcoholism and Drug Dependence: "Superb ... Dr. Milhorn has incorporated a delightful synopsis of how to be a good parent, an effective teacher, and a sensitive counselor together with a well-written, easily read, thorough review of the science and art of dealing with mood-altering chemicals .... It is The reference book for parents, teachers, counselors, students and therapist and physicians. In short, it is The reference for those dealing with young people and is a basic text in the chemical dependence field." BookList: "With a 100-plus-page pharmacological index to drugs commonly abused, Milhorn's guide to discovery, assistance, and recovery of youthful drug and alcohol abusers is replete with information. In explicit, accessible prose, addressing the not-my-child, ostrichlike approach of many parents, Milhorn examines the reasons kids use drugs and offers profiles of drug abusers. He clearly delineates the roles of parents, teachers, and counselors and includes notes on a grade-oriented curriculum beginning in kindergarten. Available treatment recommendations do not stop at counseling or clinics. Milhorn also includes advice in regard to the child returning home, covering such matters as family restoration, lapses, and the potential for secondary medical or psychiatric disorders. A valuable resource." G. Douglas Talbott, M.D., President and Medical Director, Talbott-Marsh Recovery Campus; Chairman, Georgia Impaired Health Professionals Program, Atlanta, Georgia: "Dr. Thomas Milhorn's book, an authoritative guide, is not only a must for American families and teachers, but it should be in the library of all family doctors and medical specialists." "it's everything I expected. Very helpful in my line of work." How Can I Tell If My Child Is Abusing Drugs? What Can I Do If My Child Is Abusing Drugs? Do Young Women Have Special Issues? What Help Is Available for the Rest of the Family? What Happens When My Child Comes Home from Treatment? What If Drugs Are Used Again? Does Drug Abuse Cause Mental Problems? How Are Drugs of Abuse and AIDS Related? Do I Have Problems of My Own Which I Need to Work On?